For my CAP project this year, I decided to do something at which I feel I’m particularly good: creating 3D models of artifacts found during CAP excavations. I have been using digital technologies to render 3D models for about three years now and have created these models for a number of reasons and for a number of different projects. In making the models, I use a technique called photogrammetry, which, at its most basic, takes a set of 2D images of an object, person, or place, stitches the images together, and if all goes well, a 3D rendition of that object is created in digital space.  (A lot of other computer sorcery happens deep within the software’s code to actually create the models, of which I understand none, unfortunately.) The power of this methodology and its ultimate results cannot be overstated for a few reasons, of which I will discuss a few here. The 2017-18 academic year will be a momentous one for MSU Campus Archaeology. We are now an established entity in the University with our own budget and clear goals, but as of May 2018, I (Lynne Goldstein) will be retiring from MSU, and the MSU Campus Archaeology Program will have a new Director and, hopefully, even more exciting and new directions. 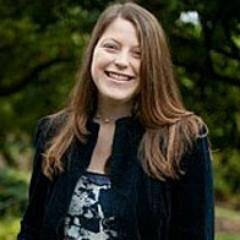 Thanks to the assistance of Dean Rachel Croson of the College of Social Science, MSU has hired Dr. Stacey Camp as an Associate Professor of Anthropology who will become Director of the MSU Campus Archaeology Program in May 2018. We have the good fortune to be able to spend this year making sure that we have everything in good shape, and preparing Stacey for the details of running this unique program. MSU has been extraordinarily generous and supportive of the Campus Archaeology Program, and I cannot thank the Administration enough for their vision in championing the program and providing both undergraduate and graduate students unique and important training and career opportunities. 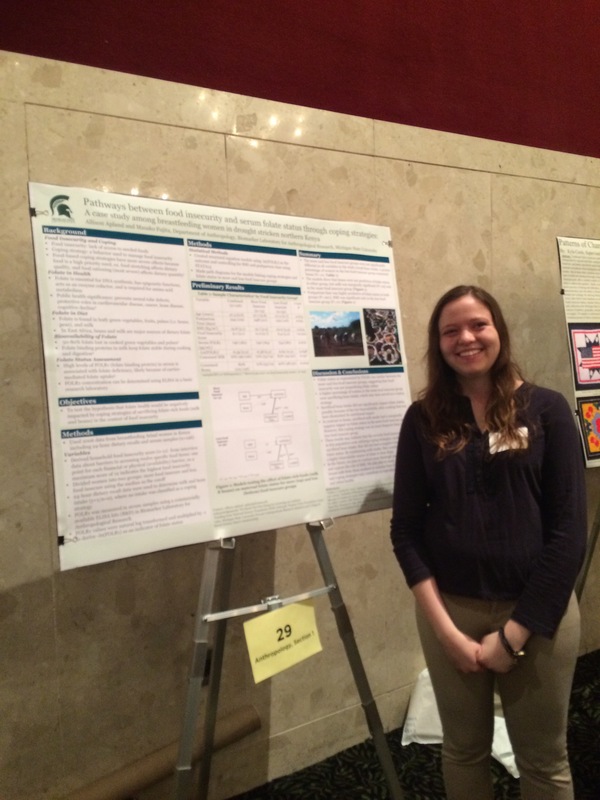 The rest of this post is written by Stacey Camp, introducing herself to MSU Campus Archaeology Program supporters. I am honored and excited to be joining Michigan State University as a faculty member in the Department of Anthropology and as the Director of the MSU Campus Archaeology Program. I appreciate the opportunity to shadow Dr. Goldstein to ensure continuity in the MSU Campus Archaeology Program. I come from the University of Idaho where I spent 9 years as a faculty member and close to 4 years as the director of one of three state repositories in Idaho. I have admired the MSU Campus Archaeology Program’s work from afar for many years, attending sessions on the project at conferences, reading its blog, and following its Twitter account. I was attracted to the program because of my own research projects, which have foregrounded a publicly engaged approach to archaeology. My research takes a comparative approach to understanding the lives of migrants inhabiting the late 19th and early 20th century Western United States. My first large-scale public archaeology project examined the lives and archaeology of Mexican migrant laborers and their families, which I blogged about on a now defunct website. My latest project looks at the archaeology of Japanese American prisoners incarcerated in a World War II internment camp, and has likewise been documented on the web. One of things I have appreciated about the MSU Campus Archaeology Program is its innovative and creative approach to placing the history of higher education in Michigan into the public’s hands. Their recent historic “MSU dinner” and their ongoing partnership with the MSU Paranormal Society to offer historic haunted tours are just a few examples of this type of engagement. I look forward to collaborating with students, colleagues, and community partners on the MSU Campus Archaeology Program to continue to develop new strategies to push the boundaries of public archaeology at MSU. 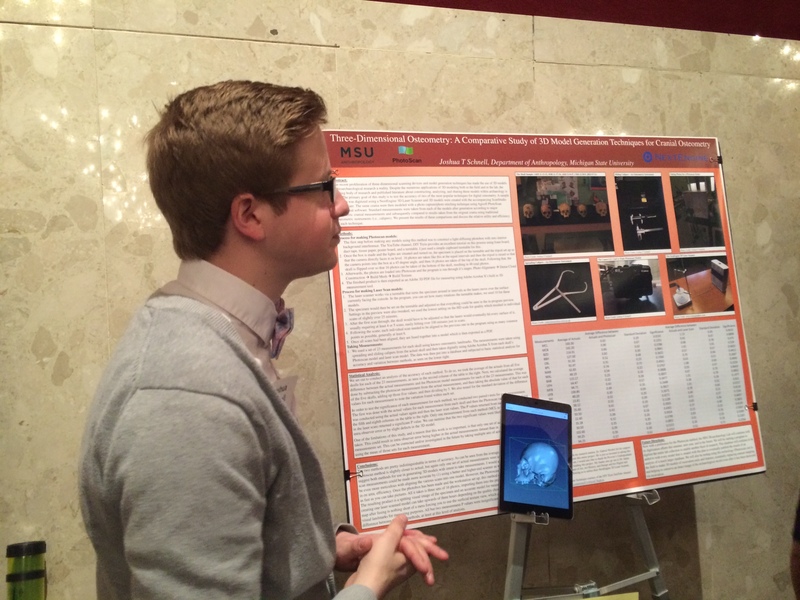 Josh Schnell pulled double duty and presented on Mississippian landscapes and 3D cranial modeling techniques. He was able to determine new information about gravel use at Aztalan which again underscores the unique nature of the site. His research into 3D modeling answers important questions about whether this new technology gives us similar data when compared to traditional methods. 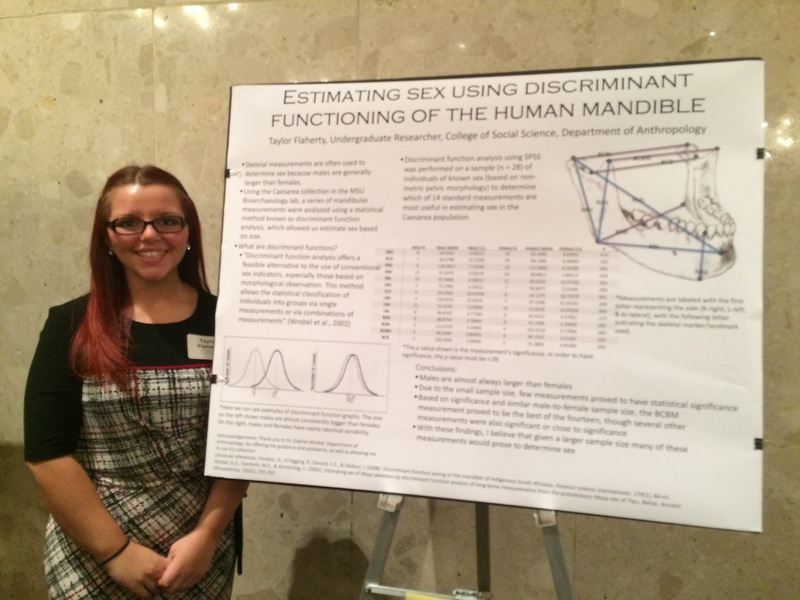 Taylor Flaherty examined sexual dimporphism in a small sample using the mandible as her data source. This research is particularly important when considering bioarchaeological samples that are poorly preserved and unable to be sexed using traditional methods. Allison Apland presented a very interesting project about food insecurity in a population of breastfeeding women in Northern Kenya. Her work examines how women cope with food insecurity and how those strategies affect dietary quality and health. This project has important implications across sub-disciplines in physical, cultural, and medical anthropology. 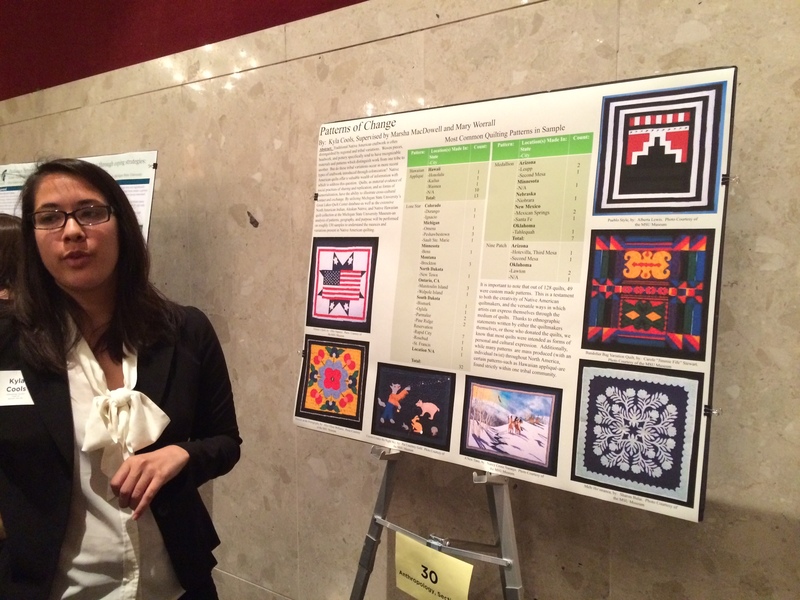 Kyla Cools looked at a little-used data source, traditional Native American craftwork quilts, to understand patterns and variations that may point to aspects of cultural identity and change through time. Her findings were very interesting and she spoke eloquently about how she thinks scholars should begin to use utilitarian pieces like quilts in their understanding of Native cultures, memory, and representation. 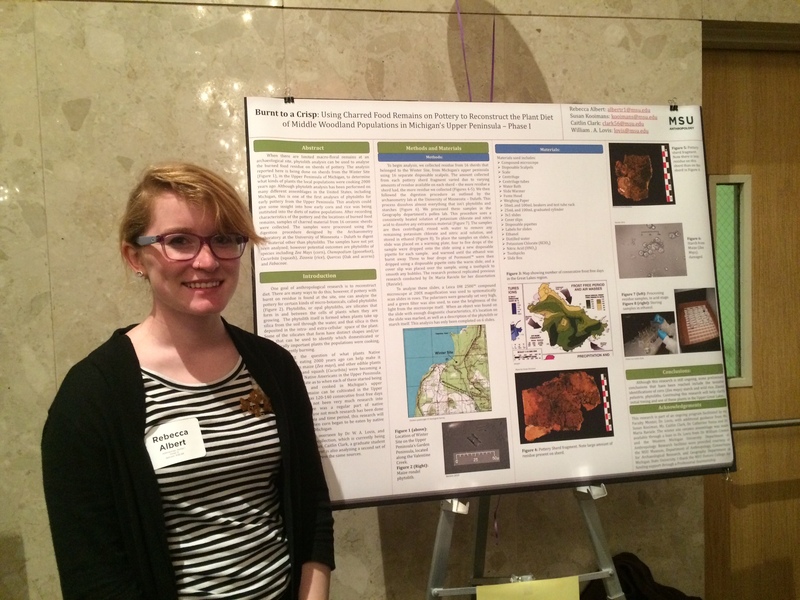 Rebecca Alpert relayed her research on using charred food remains on ceramics to understand Middle Woodland dietary choices. This research begins the first lines of inquiry into how Upper Peninsula populations were cooking and eating some 2000 years ago.